We decided to split proposed 90+ k day into two, which was probably a good thing because today’s 46.5k became 55.6k, so we would have been creeping up over 100k (and one of those was enough!) 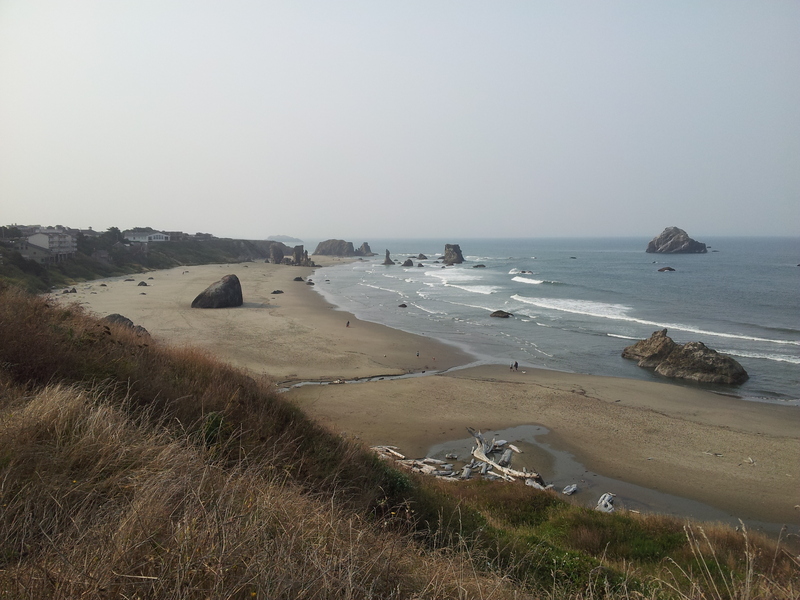 While I’m a little bit worried about getting to SF with a few 50k days, it was good to spend a bit of time checking out the coastline. 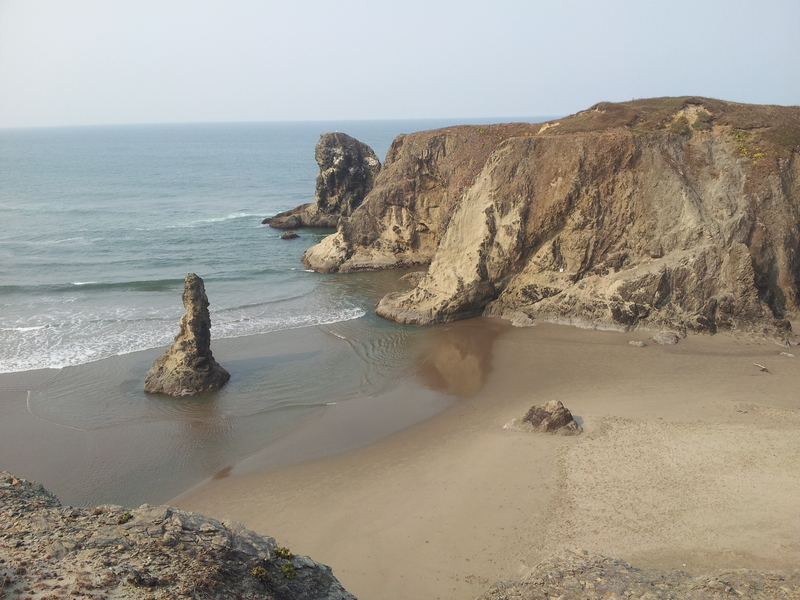 Bandon, so far, has been one of my favourite places. Click on the map to open a new window with bigger map interface, and zoom-ability. We got a bit excited with this scenery. This was the first place where we decided it was time to rip out the specially purchased selfie-stick and give it a whirl. He thinks we make way too many of these stops for me. I am still a bit overwhelmed by the size of the RVs and caravans. I think it’s a bus or a truck coming behind (in my little rear vision mirror), but it’s ‘just’ an RV! Or the Fifth Wheelers. Basically a caravan semi-trailer. With me doing the calling (particularly on a right-hand bend- I’m wearing my right-hand drive mirror because of my short-sighted left eye), I’ve resorted to saying “Something BIG!”. Still, overwhelmingly, so far (*touching wood*) the drivers, in general, have been more courteous than back home. Sure, still a few don’t move over in the lane (or even change lanes when they could). But we haven’t been abused yet. And far more cars (on the minor roads) slow down behind you. Lunch stop in a little place called Langlois, which claims (on its town-sign) to be ‘world famous’ (but we still don’t know how they pronounce it! )… and to have ‘world famous hot dogs’ in the (what we’d call a) general store. Never mind that I’d noted there was actually a cafe in Langlois. We tried the hot dogs. Which were… hot dogs. 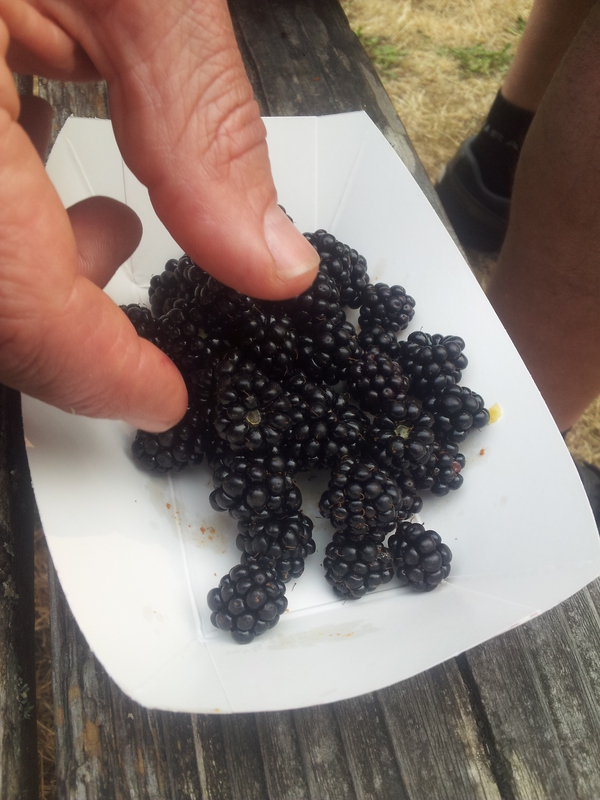 The only upside to that stop was having blackberries for ‘dessert’. From day 1 we’ve seen blackberries growing by the side of the road everywhere – and quite a few people stopped picking them. So Marc went foraging. 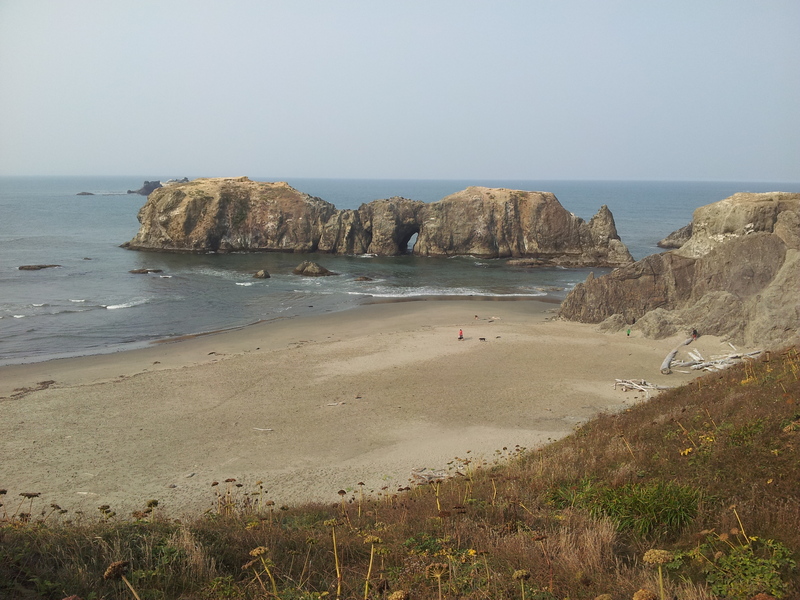 I’m pretty sure Port Orford would look a bit more spectacular if it wasn’t so smokey. 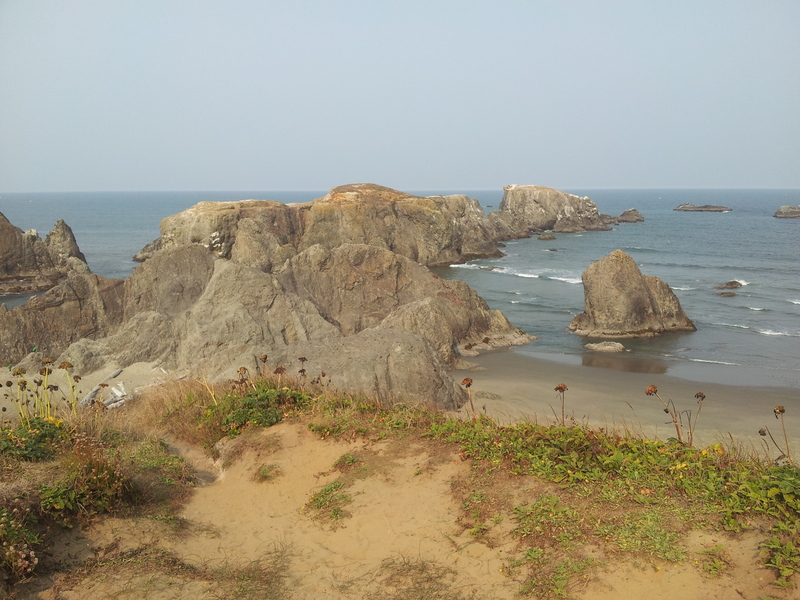 Coast looks really interesting ! You getting any effects from the forest fires we have been hearing about ? Weather looks good ! 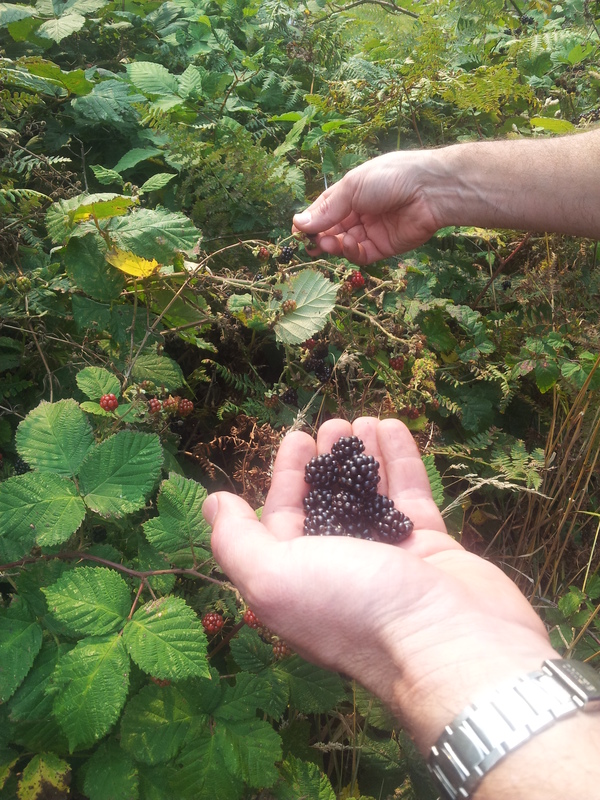 Blackberries that takes me back, some very good photos guys, it looks like your having a ball!! 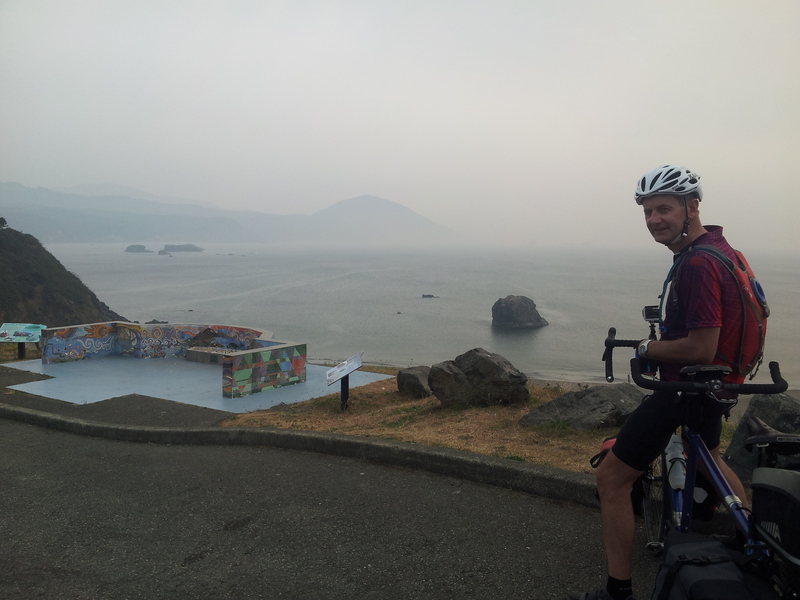 love the rocky coastline, and a pity about the smoke haze. Hi, some good photos, bummer about the smoke. Has it been smooth riding? Glad to hear the traffic has been ok. Must be good to have a refreshing drink of a night. Take care and look forward for more updates.